A useful and directing guide for Zurich travelers. Smart advices for eating, shopping, accommodation and things to do alternatives. You feel you are falling in love with this city when you see the sun rising over the lake Zurich in the blue sky, shadowing the beautiful buildings weaved of the amazing architecture. Zurich, the generously gifted city flashes in your eyes with the colors of blue, green and white at first sight. The smell of chocolate you sense in every breath and you are surprised to see the order reign in every corner of the city. Everything seems to be designed for the people’s pleasure in this city. You can enjoy the life to the fullest rather than living automatically. Do not get surprised when you see a little boy carrying his snowboard in the subway or the well-dressed Swiss people lying in the parks near the lake. Being the biggest city in Switzerland, Zurich is also a cosmopolitan city that is home to the people from many nations in the world. All these people have the privilege to live in a city that offers high standards to its residents. You will witness the natural beauty, luxury and prosperity in one frame in this city. If you are ready to get lost in the magic of snow in the Alps, or relax in the beautiful green lands, Zurich cannot wait to welcome you in its affectionate arms. Zurich is located at the northwestern tip of Zurich Lake and in north of Switzerland. Located 13 km away from Zurich’s city center, Zurich Airport is Switzerland’s largest airport. For transport options from the city center to the airport, you can simply take a look at the Zurich Airport’s official site and plan your flight accordingly. If you like to view the Lake of Zurich or the Alps panoramically, Uetliberg should be your favorite stop in Zurich. Considered as the Zurich’s rooftop, Uetliberg offers you hiking or biking tours as well as remarkable restaurants. Zurich’s Old Town is a must see place for its cultural and historical offerings. Zurich’s symbol Grossmünster (Great Minster) and Fraumünster are also located here. When you feel stressed or tired (in Zurich it may not be possible) the green parks near the Zurich Lake will be the places where you will inhale the fresh air under the mesmerizing smell of the beautiful flowers. Swiss National Museum will give you everything you need to know about Swiss life from prehistory to the present. Housing the largest collection of history and culture, Swiss National Museum is like a fairy castle. Have you ever thought about how would dining in dark be like? In Blindekuh, you will have the chance to experience this. Partially sighted and blind service team will guide you inside and you will only need to trust your nose and your palate. Presenting the best European cuisine, Kronenhalle is a world-renowned restaurant where you can eat under a cozy ambiance. In this beautiful Swiss city, you may enjoy the nights until 03:00 am and the areas where you can prefer for a great nightlife are Niederdorf, S-Bahn Station and Escher-Wyss Square. There are numerous bars, clubs and cafés in those areas to meet all kinds of tastes. Rhine Falls is a visual feast that will make you feel like you are in a fairytale. The castle which is located in the forests near the falls is thrilling. Sport activities in the falls like canoeing, rafting and rowing are also popular. Come to Rapperswill, the historical middle ages village, to discover the Switzerland’s country side. Mostly known for its rose gardens, Rapperswill also houses a castle, numerous restaurants and cafés. If you need to rest your eyes and mind, Zurich Botanical Park is an oasis in the city. Being home to the wild flowers and plant varieties, This botanical park resembles to igloos. There are two places you should absolutely pay a visit for shopping in the city. Bahnhofstrasse is the world’s most popular and premium shopping boulevard. You can find many famous brands and luxurious shopping centers on this boulevard. In Helvetiaplatz, there is a market set on Saturdays that you can find anything from souvenirs to clothing and jewelry. It is wise to visit here for you can buy many things at reasonable prices in one go. If you still do not have the idea about what to buy from this Swiss city, this list will help you. Be sure they are all in your luggage before you leave. 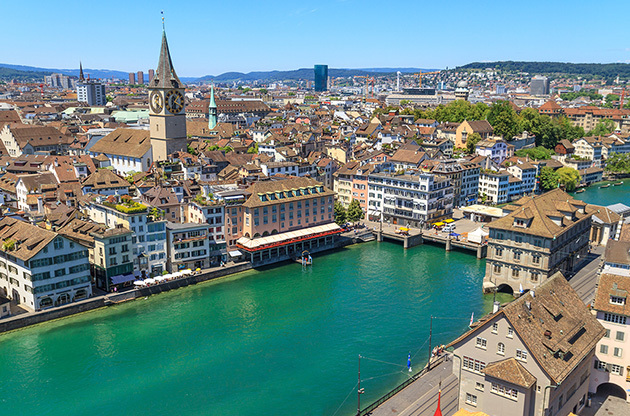 Located in the heart of a very central country, Switzerland, Zurich is a very advantageous city for international gatherings. Its charming nature, cultural position and attractions offer so much to discover makes Zurich an ideal hub for both national and international events. Inspiring enough, this Swiss city adds much up to the leading events of each sector in terms of depth, innovation and creativity. Conferences, fairs, exhibitions, tradeshows, symposiums and congresses in Zurich are numerous and draw global attention to the city.